I wrote my very first novel on the rainbow-colored pages of a Hello Kitty notebook. I was eight. It definitely read like an eight-year-old’s first novel, but it also was over 80 pages of a story with characters, a plot, and dialogue. I had a lot of maturing and growing to do, but even then I knew I was a WRITER. My parents encouraged this every step of the way and their support fostered creativity and faith in myself as a writer. Because of this new age of digital media, we have many more opportunities than ever before. This can be a great thing, but it also has some pitfalls. Here are 7 ways to encourage young writers. A Note to Parents: These suggestions may not be suitable for young writers of all ages, especially the ones related to the internet. I would recommend you continue to use the common sense and boundaries that you already have in place with regards to these! A Note to Young Writers: If you are reading, I’m so glad you are here! Please contact me if you have questions or need more resources. I would love to help you on your writing journey. Do this right now. Immediately. Domains are a commodity and it would be great for you to own your child’s name.com right now. It costs less than $10 to buy and keep one as a placeholder, even if you don’t want a website yet. (More thoughts on owning your own name.) Do make the domain private (a paid service) so your family address, email, and other information cannot be accessed. If you DO choose to actually make a site, this will represent your young writer, so do be professional. Consider gifting this as a graduation present, as I have known some parents to do. 2. Get a Twitter handle. Many social media platforms come and go. Twitter is, I think, in it for the long haul. Facebook also might be, but with it’s ever-changing algorithms for pages, I would recommend Twitter. I have also found that Twitter is a great place to make connections with other writers and reveals less than a Facebook profile. (Some tips for using Twitter!) Encourage your child to use it as a WRITER, not simply as interaction with friends. (If your child uses Twitter with friends, perhaps set up a separate Author Twitter handle.) Read these tips on how to use Twitter as an author. 3. Find community through Wattpad. Wattpad is a place where writers can register, post their work, and read the work of others. Many people use it to reveal their work chapter by chapter, receiving comments and shares from other Wattpad users. Writers can be inspired by other writers, connect with new readers, and be part of a community. *A word of caution to parents: Not ALL writing on Wattpad is appropriate for all ages. Check it out with and for your child and make appropriate boundaries. 4. Set up good work habits & goals. Writing should stay fun. But young writers can also learn about writing as a craft. Whether that is taking classes, attending a conference (like the Teen Book Con here in Houston), or simply setting up a time to write each day, young writers can learn good habits now that will help in the long run. Encourage your child to both foster creativity and also discipline. 5. Consider self-publishing on Amazon. Every year in elementary school, I entered the Young Authors competition (and even won a few years). It was my favorite time of year because I got to write a book, then bind it together and hold it in my hands. There is something magical about holding your own book in your hands!! 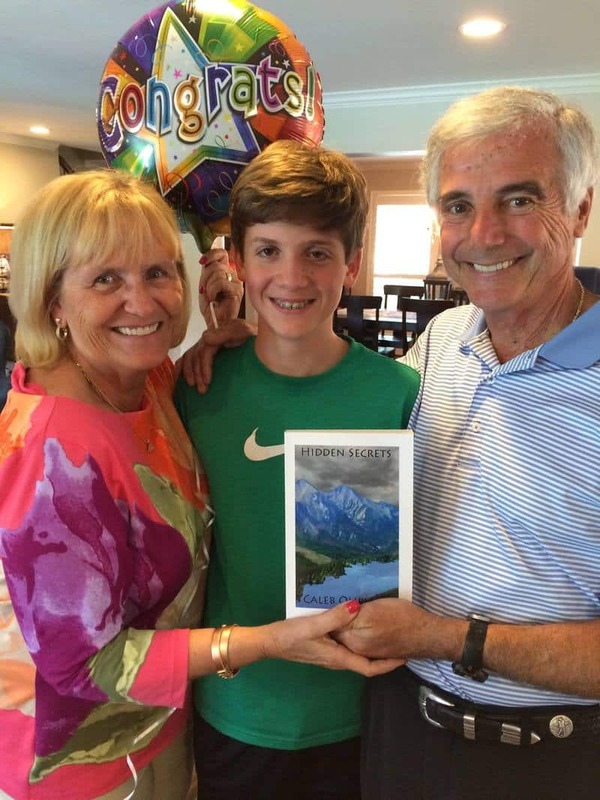 My nephew just published his first book on Amazon & Create Space and I couldn’t be prouder! But I use the word “consider” seriously. The only flip side to self-publishing is that the internet has a long shelf-life. Perhaps later on, your child might be embarrassed for that work to represent him or her. That work will carry his or her name (which could be a privacy concern) and will represent him or her. If you do decided to make the book available to the public, take it seriously. Hire an editor to make the work polished. Make sure the book formats correctly and also has a slick cover! 6. Start an email list. This may sound like a strange one, but if your young writer does want to become a serious published author one day, starting an email list would be an asset. For now, it could be dormant like a website. Maybe it would be friends and family to start with, but your young writer could collect emails and add them to the list along the way. If he or she does publish on Amazon or Wattpad or has any fun writerly news, this email list could be the place to share it. No one EVER regrets starting an email list too early. (Read how to start an email list.) An email list is a valuable digital commodity and would be a huge resource to start early. I don’t know any writers who were not also voracious readers as children. Read with your child and to your child. Take your young writer to author readings and to the library. Budget for books. Spend time in book stores. Allow for extra time at night for reading before bed. Mix up the kinds of books for your child—maybe encourage him or her to read one classic for every two or three modern or YA books. Readers don’t always write. But writers always READ. How were you encouraged by your parents as a writer? Or how have you fostered creativity and writing habits in your child? This entry was posted in ebook, Publishing and tagged Copywriting, creative writing, Daily Writing Tips, DailyWritingTips, ebooks, improve your writing, improving your writing, inspiration, making a living as a writer, Motivation, on writing, Uplifting writing, Write Practice, writer, writers, Writers Write, writers' group, writing, writing career, Writing Forward, writing goals, writing in dialects, writing practice, writing tips, writing tools, young on May 3, 2018 by First Edition Design Publishing. 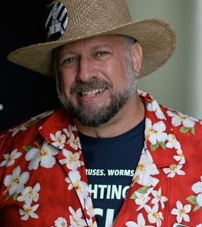 Founder of Ebook Friendly. Ebook enthusiast, technology geek, iPhone artist, and self-published author from Poland. There are a lot more book reading apps for iOS than just iBooks and in this short overview you’ll find my top 5 recommendations. There is no iBooks in the list and I did it in purpose. 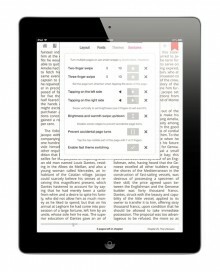 Its unique feature is that you can shop iBookstore directly within the app. That is not a result of an outstanding app development, but Apple’s policy (30% cut from any purchase) which prevents competition from adding in-app purchase option. Most popular book reading apps are tied with particular ebookstores. Kindle, Kobo, Nook or Sony are designed to let users of these ebookstores access books they bought there and manage their personal bookshelves. Kindle app is one of most advanced book readers in the iTunes AppStore. You can read not only books, but also newspapers and magazines that you subscribe via Kindle Store. The app supports enhanced ebooks, the ones described as Kindle with Audio/Video – something you can’t read on your Kindle e-reader. On of the most convenient features Kindle app gives is the ability to send own ebooks to an email address that is specific to your Kindle app (and different for Kindle apps on each and every of your iOS devices). To find this email, slide the top bar to the right to reveal Docs section. Right below you’ll see “Send documents to” and the email address. Every time you send a file with an attachment in mobi format (DRM-free), it will appear in the relevant Kindle app right away, so there is no need to download it from the cloud library. The way dictionary works is also very specific – and much more useful than in other apps. When you jump to a full definition of the word in the dictionary, you are still able to get the definition of words there. Thanks to that you can further explore word’s meaning, as it’s not a one-step lookup, like in other apps. Some books from the Kindle Store have a great feature enabled which is called “X-Ray”. It allows to better understand the book’s structure, and helps a lot if you’re lost in a plot. The feature comes together with Book Extras, powered by Shelfari. It’s editable book encyclopedia – a list of most important facts about the book. Kindle app, however, is missing one feature. This feature is offered by Google Play Books and it’s the reason why Google’s app is in this overview. It’s instant translation. If English is your mother tongue, you may not understand why translation is so important. If you speak another language and still learn English, looking up for the meaning of a word in a dictionary may not bring the immediate association of what this word is in your mother tongue. Translation is a quick help in every case like that. You can get a translation in just two two taps. Tap on a word or select a passage, and a pop-up window will appear. Tap on Translate and set up language-to-language translation flow (you’ll have to do it only once). Translation is powered, obviously, by Google Translate. You’d be surprised how accurate it is, not only for words but entire sentences. I’ve found a workaround to translate words in the Kindle iOS app, using Google lookup as a tool. Anyway, Amazon should include it if they seriously care for international customers. Translation seems to be not a big deal. If eBookMobi app can have it, why not Kindle? If you need a quick language dictionary lookup, Google Play Books is for now the best option. 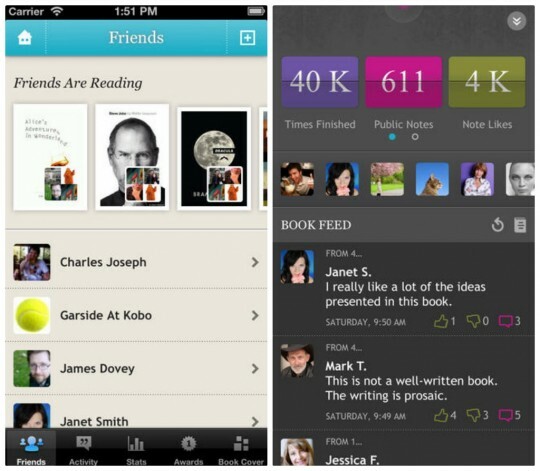 Kobo’s set of social features is called Reading Life. You can not only read the book, but join a conversation about it at any time. There is a Kobo Pulse indicator at the bottom of the page. It get brighter on pages with more comments and reader activity. When you tap on it you’ll see what other readers think about what you’ve just read. You can also share your own notes and thoughts. Simply, highlight the passage and write down your comment. By connecting with your friends’ Reading Life on Facebook you’ll know what they read, as well as view and compare their awards and stats. 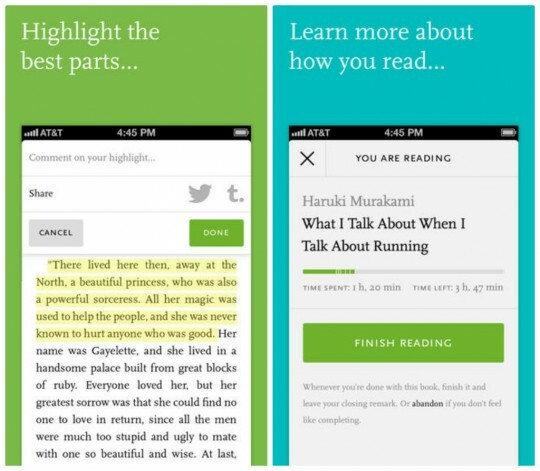 Awards and stats are two other features that lets read a book in a more dynamic way. Any time you can check out how quickly you read: how many pages per hour or how many hours per book. There are also several awards to win while you use the app. These awards ”help celebrate fun milestones in your Reading Life”. You can become a Scout Leader or Deep Thinker or Night Rider, depending on how and when you read and use the Reading Life. The three apps above are devoted to get access to particular ebookstores, but if you prefer independency you should check out Readmill app. You can start using the app by signing in with your Facebook credentials. 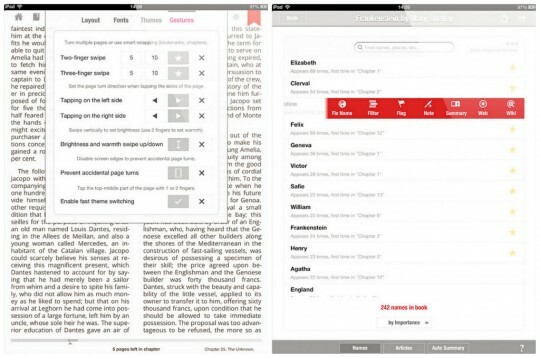 The app supports popular file formats, epub and pdf – also the files with Adobe DRM. Readmill’s Adobe DRM support lets you read with this app books bought in Kobo, Barnes & Noble, Sony Ebookstore. Remember to authorize the iPhone or iPad with your Adobe ID, before you start downloading the files to Readmill. 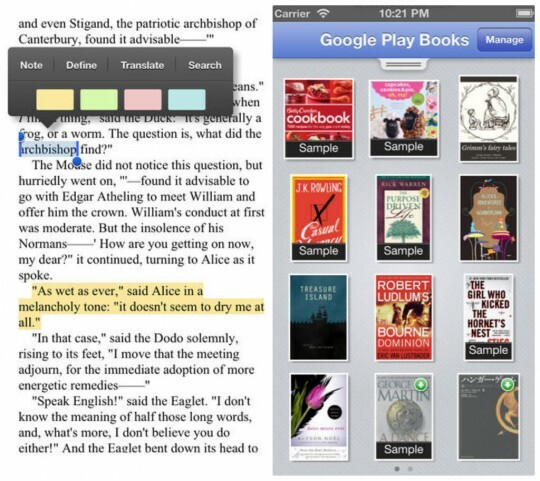 The app is a clean and simple combination of a book reader, book discovery tool and social reading. You won’t feel overwhelmed with too many features, and can start reading right away after downloading the app. What’s the strongest side of the app is it’s sleek interface. It’s definitely the most beautiful book app in the iTunes AppStore. In fact, Readmill’s minimalist design had the iOS 7 look long before iOS 7 was announced. Making ebooks beautiful is very difficult, because the design comes as a result of two factors: how the ebook is formatted, and how the book reader is designed. Readmill does the second job perfectly. Although Readmill is an independent app, it lets you sync your library via the cloud. You can download books directly to the app on the iOS device: (via email, cloud service app like Dropbox, Safari, or in-app catalog), but you can also add books via Readmill.com website. Kindle is one of the most advanced book readers for iOS, because the most advanced one is Marvin. The app is available only for the iPad, and that’s because you can only see on a larger screen how much it can offer. Marvin app gives you the most advanced personalization panel ever. You’ll not only change the font type and size, but can set up a different one to text and a different one to heading. You can define your own theme (different for a day and night), but best of all you can also set up your own gestures, for instance swiping to control brightness, or page turn directions, or snapping to bookmarks. Marvin supports DRM-free epub files only, but it lets add new books right within the app: via built-in browser, Dropbox, or OPDS catalog. 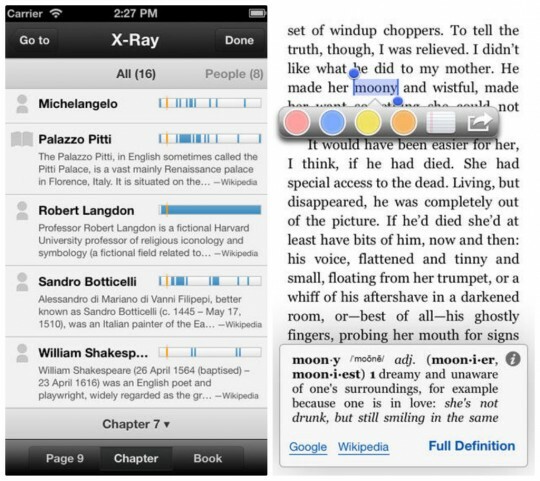 Most importantly, Marvin app lets you analyze the book the way Kindle’s X-Ray does – and you can have it for every book, not only X-Ray enabled. Marvin intelligently looks up extended information on Wikipedia without leaving the app. You can look up characters or places in the book you’re reading to see biographies, articles, or photos. The app supports metadata and Calibre book management. The ways you can search your library of books are extensive: by tag, topic, vocabulary and even by number of words. This entry was posted in Publishing and tagged ebook friendly, ebooks, ereader apps, ereaders on September 13, 2013 by First Edition Design Publishing. As the eBook industry continues to evolve, there are more and more acquisition and collection development options available to libraries, which is a great thing—once you can make sense of them all. Subscribe or purchase? Outright or demand-driven purchase? What about short-term loan and loan-to-own? There are so many variables to explore, and these are just a small handful of the business model considerations available to libraries today. This special webinar event, hosted by EBSCO, will address key points to consider when navigating eBook business models, and will also take a closer look at other options, including ordering services (e.g., EBSCOhost Collection Manager, GOBI and OASIS), eBook providers, user experience, digital preservation and much more. Can’t make it April 23rd? No problem! Register now and you will get an email reminder from Library Journal post-live event when the webcast is archived and available for on-demand viewing at your convenience! This entry was posted in Publishing and tagged ebooks, ebsco, library on April 2, 2013 by First Edition Design Publishing. Amazon has started its Chinese Kindle incursion by launching the reader app for Android and iOS in that market, along with a large selection of e-books. There’s no mention of any Kindle devices like the Fire HD in the nation yet, but Amazon just did a similar launch in Brazil and said the hardware would be along there in a few weeks. Four Kindle devices recently showed up China’s FCC-like Radio Management Agency as well, according to TNW, another good omen for those anxious to get the devices in that country. And the number who want one could be considerable — China’s been carrying on an illicit love affair with the Kindle for quite a while, after all. This entry was posted in Uncategorized and tagged amazon, china, ebooks, kindle on December 18, 2012 by First Edition Design Publishing. “Europeans assume that, given the right knowledge and ideas, personal relations can be left largely to take care of themselves, and this is perhaps the most fundamental difference in outlook between Africans and Europeans.” Jomo Kenyatta, first president of Kenya, from his book Facing Mount Kenya, 1938. Africa is not only a land of rich natural resources, but a land of rich culture dating back to the existence of the first man on earth which archeologists believe lived in Africa. Egypt, the home of civilization had written sources dating back to prehistoric times (hieratic, demotic and hieroglyphics) which they used to preserve their customs and traditions for future generations. Africa’s rich and diverse culture must be preserved for posterity; in the words of Gandhi “A nation’s culture resides in the hearts and in the soul of its people.” From Dakar to the Horn of Africa and from Cape Town to Alexandria, different cultural heritage and arts exist which however are gradually losing value as a result of ‘modernization’ and varying levels of interest shown in their preservation. African arts and culture, though rich are sometimes “thrown to the dogs” and some governments appear to only become interested in them at the time of an important personality visiting the country, then, they quickly organise an arts and culture group to welcome them. Many children are not interested in learning the language and culture of their people. This is very unfortunate and we must not allow our culture to die. In the words of an anonymous writer, “Africa can only be as strong as the institutions she creates and sustains to feed her mind, body and soul”. Swahili, Dagaare, Hausa, Yuroba, Akan among other languages can all be preserved at low cost using a simple technology called ‘an ebook’. An ebook is a ‘‘book in electronic format. It is downloaded to a computer, PC, Mac, laptop, PDA, tablet, smartphone or any other kind of reading device, and is read on the screen. It can have numbered pages, table of contents, pictures and graphics, exactly like a printed book’’. This means that, the traditions and customs of Africa including the languages of the various ethnic groups can be preserved in this simple technology which can last for thousands of years for the future benefit of our children and children’s children. In Scotland, for example, a media company called Giglets Limited is helping to preserve the modern heritage of an ancient language of the Celtic people called Gàidhlig (Scottish Gaelic), and ebooks are now playing a part of this strategy. How are they doing it? Giglets in partnership with the Gaelic Books Council (Comhairle nan Leabhraichean) and Stòrlann Nàiseanta na Gàidhlig is working tirelessly to encourage the use and support of this culturally rich language. Ebooks are used to teach and encourage the use of this language, within Scotland as well as in communities and by individual speakers as far afield as Nova Scotia in Canada, the United States, Germany, Australia and New Zealand. It is in this light that Giglets Lmited would like to partner with organisations and governments in Africa to help preserve African cultural heritage for posterity and to promote ebook education on the continent. This entry was posted in Uncategorized and tagged africa, culture, ebooks, scotland on November 7, 2012 by First Edition Design Publishing. If you’re an iOS user, there are a wide variety of choices for reading ebooks — there’s the first-party iBooks solution, as well as strong options from Amazon, Barnes & Noble, and Google. If, for some reason, those apps don’t meet your needs, Sony has just announced the availability of its Reader iOS app. Much like the aforementioned apps, Sony Reader lets you log in with your Sony credentials and download all of your purchased books to your iOS device. While the app itself doesn’t appear to do much to distinguish itself from the other ebook readers available for iOS, it’s an important part of Sony’s overall entertainment strategy — it wants to get its services on as many devices as possible. Reader is already available for Android, as is Sony’s Video Unlimited and Music Unlimited apps (the latter of which is also available on iOS). And while we’d be surprised if this app gained much traction on iOS, it’ll be useful for those out there using one of Sony’s E Ink readers who also want to read on their iPhone. This entry was posted in Uncategorized and tagged ebooks, ios, sony on November 6, 2012 by First Edition Design Publishing.